You soon learn as an osteopath that every body is different and unique. No two postures, movements or conditions are the same from one person to another. That being said however, there are certain things that you become very used to seeing; tight hip flexors being a prime example. We are a nation of sitters and our poor hip flexors are not thanking us for it. The hip flexors are a group of muscles at the front of your hips that allow you to pull your knees up towards your chest. When seated, the hips are maintained in this flexed position. Although they allow you to achieve this movement, the hip flexors are not designed to spend prolonged periods doing it and, actually, their true function is quite the opposite. In order to explain the true function of the hip flexors, we firstly need to look at a key principle of the human body called “load to explode”! Load to explode – what is it and why is it important? You may often hear osteopaths or personal trainers using the world “load” when referring to muscles. The true meaning of the word “load” is when a muscle is active or tense while in a position of stretch. For example, when you are in a squat, the muscles in your bottom (glutes) are under stretch and also active in order to support your body weight under the force of gravity. We could describe the glutes in this position as being “loaded”. Muscles are like slings, they are designed to catch the body at the end of a movement such as a squat and fire you back in the other direction. If you wanted to “explode” out of a squat into a jump, you would have to go through the “load” phase first. Try jumping up without bending your knees first – you can’t do it. There is no “explode” without the initial muscle “load”. Let’s apply this to the hip flexors. This muscle group is under stretch when the leg is behind the trunk. Picture A below shows the hips in flexion (hip flexors short) and Picture B shows the hips in extension (hip flexors under stretch or load). The more time we spend in A, the less ability we have to do B! 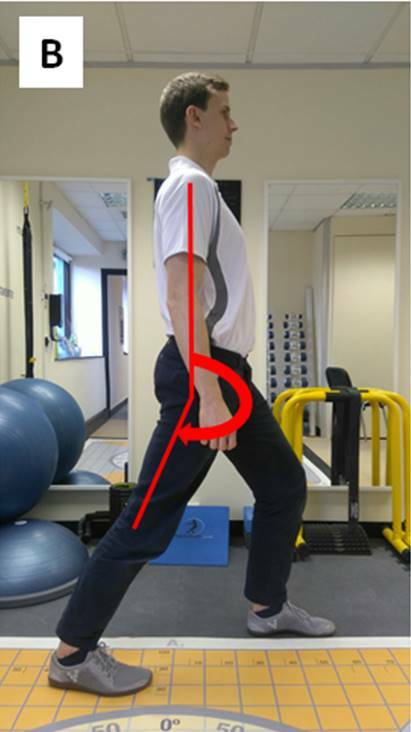 The true function of the hip flexors is to catch and slow down the leg in the back stride of your walking cycle (Picture B) and then fire (or explode) the leg forward into your next step. This allows us to have a long, efficient stride length when walking. If our hips had no ability to extend behind our bodies, due to very tight hip flexors, then we may begin to walk very differently. 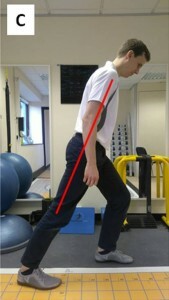 In Picture C, the leg is behind the body but, unlike Picture B, due to the trunk bending forward there is no actual hip extension being achieved. Stooping when walking is one of the adaptations the body might make if no hip extension is available. Try it for yourself – take a long(ish) stride forward while keeping your back heel on the ground. Can you keep your body upright, or does it want to lurch forward? If it’s lurching forward, it may suggest that your hip flexors are very tight. The body, however, is smarter than this. Despite the fact that a lot of us have very tight hip flexors, we don’t all walk around looking at the ground with our bodies bent forward. The body will do what it can to lift the chest and the eyes so that you can see where you are going! But if it can’t get that extension from the hips, it will steal it from somewhere else. How about another part of the body nearby that has the ability to extend – the lower back! 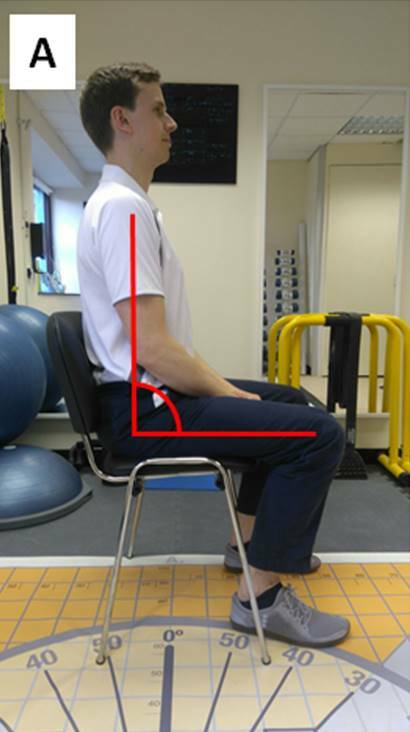 The lower back is happy giving you a small degree of extension when you walk, but it will soon become rather annoyed if it has to regularly work hard to extend your body because your hip flexors are not doing their job properly. Regular over extension of the lower back is a very common way to, not only, cause back pain but also to cause degenerative changes in the lower back over long periods. Do you have niggly back pain when sitting, or trouble bending forward to put on socks and shoes, or changing a baby – this may well be due to your back overworking and becoming fatigued. The lower back invariably takes the blame when it becomes sore, but often it is only taking on excess work for another area of the body that is limited, tight hip flexors being a notable culprit. If you don’t use your hip extension then you will lose it, and your body find other ways to keep you upright. So, do your lower back a big favour and stretch those hip flexors – it’s about time the two of them got on a little better. Osteopathic assessment and treatment can help to identify and alleviate these dysfunctional patterns in the body. Dry needling, manual techniques and assisted stretching are particularly affective to encourage more openness in the anterior hips, and more freedom in the lower back.